Well, we may be in paradise, but the same mundane chores have to be accomplished. I spent three hours doing 3 loads of laundry at the marina with three washers. After lunch we biked to see how close the nearest Laundromat was. It is within biking distance, so we might try that next time. However, there was an advantage to doing laundry at the marina, because I met another woman on a boat nearby. We invited her and her husband for cocktail hour and got to know Kathy and Randy on In Transition. They come from near Buffalo, NY where Randy said they have had 22 ft. of snow so far this year! I bet they are glad to be in Marathon! 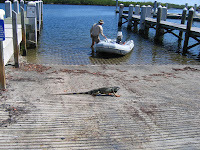 Saturday was a very nice warm day, so I had Al take me in the dinghy to Sombrero Beach while he tinkered on the boat. The single side-band doesn’t seem to be transmitting so he is trying to solve the mystery. 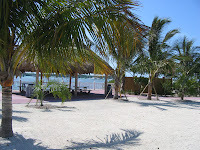 On the cruiser’s net in Boot Key Harbor, I learned that they have a yoga class at the pavilion of the community park next to the marina. I have never done yoga but thought especially since it was free, that I would try it. I tried it and I liked it, so I will be doing that three mornings a week. We also heard a nearby restaurant was having a pig roast, so we went with Kathy and Randy. There was entertainment, a Jimmy Buffet- type singer, as advertised. But all you got was shredded pork served with bake beans and coleslaw. By the time we ordered they were out of the pork except for one serving, so the rest got mahi mahi sandwiches. It wasn’t what we were expecting. Monday dawned and a front came through so it was a bit windy and cooler. 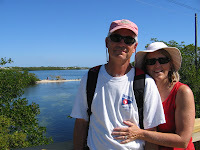 Randy and Kathy said they were biking to Pigeon Key which we had told them about the day before. We decided to join them and packed our lunches and headed out. 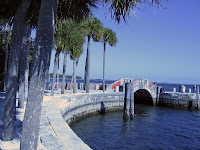 This very small island is connected to land by the old railroad bridge that Flagler had built. No motor vehicles are permitte d, but you may walk or bike to it. It housed the 500 workers who helped build the railroad. We saw a half hour video about Henry Flagler and how he is responsible for developing most of Florida by building the railroad with his own money. Our tour guide was very animated and you can tell loved her job. 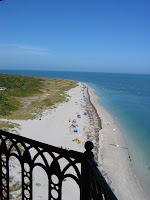 She explained all about Pigeon Key and the few buildings that were on it as well as more information on Mr. Flagler. It was a very interesting day and I must say that I really admire Flagler for all he did for people. We biked back doing about 8 miles in total. Our days are filled with the tasks of running the generator, food shopping, bike riding, getting water at the dock and bringing it back in 7 gal. water jugs. We could move the boat into the dock, but with the winds blowing 18- 22 knots the past few days the water jugs keep us supplied just fine. Today I made a cake for the “Greet, Meet and Eat” at the marina. 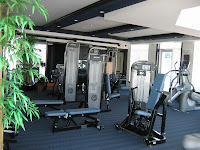 We hope to get to know a few more of our 250 neighbors. Are we in paradise yet? We had no problem getting out of John Pennekamp State Park through the mangroves and made it out into Hawk Channel and raised the sails. We had a wonderful beam reach down to Indian Key with about 10 – 15 knots of wind. 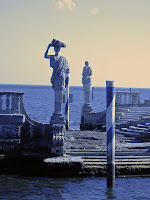 It is a very small island with a lot of history. 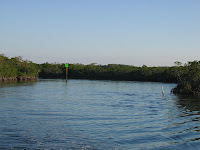 The park service provides four mooring balls for cruisers. We picked the closest one in, and decided that 5.5 ft. at high tide was not good for our 4.5 ft. draft when the tidal range was 1 -2 ft. We had to move to one further out which did not give us as much protection from the prevailing winds. On the 11 acre islan d, paths have been made where all the roads from the 1800’s small town were. The remains of buildings have placards with information about the building and it‘s owners. We learned that Jacob Housman was the colonizer of the key-a man who salvaged shipwrecks. He grew rich on Indian Key because the ships foundered on the reefs not far off. The Seminole Indians attacked the town in 18 40 and burned down the entire town except one house, killing 16 people, but Housman and his family lived through it all and eventually moved to Key West where he died shortly thereafter. His gravesite is on Indian Key, but his skeletal remains and gravestone were stolen. A replica is in place today. It has some beautiful views off the island. For such a small island, it was very interesting. The wind did not ease overnight so we bounced around quite a bit on the mooring ball. We were anxious to leave in the morning, to get rid of the jerking motion of the boat against the mooring ball. We were headed to Marathon in Boot Key. We were correct that the broad reach sail was much more pleasant. 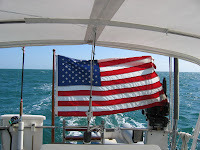 We heard that Pat and Ken Howe from our sailing association were heading south along the east coast of Florida. When I called they were down in Key West so we made plans when they were coming north to meet in two days. 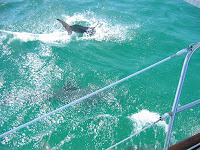 While sailing we had the “dolphin experience” again . 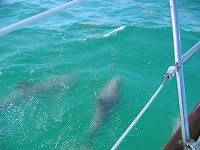 There were about 4 or 5 dolphins playing in our bow. I took pictures but mostly caught them when they were just below the surface as you can see. It is soooooo… much fun to watch them. Late morning Al called the city marina and found out that all 250 moorings were filled but there was still some room to anchor. We got in around 1pm following another sailboat in. They of cour se took the easiest and most obvious anchoring spot. We tried to go in back of them and were going aground on the sandy bottom. So we motored out and were looking for another spot when the captain of the boat who just anchored hailed us on us on the VHF radio. He told us where to go to get past the high point we hit and end up in seven foot of water near the bridge. We placed two anchors out again since it was blowing 18-20 knots. We prepared the dinghy to go ashore to get on the waiting list for a mooring. 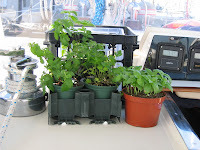 As you can see there are "mucho" dinghies! We were told it could take one or two days. We were number five on the list. Back to th e boat for a fairly quiet afternoon and evening. And another beautiful sunset but with a bridge in it this time! After breakfast we finally took our bikes out of the back cabin and took them ashore in the dinghy to the bike racks with the other 300 bikes that were already there. We needed fresh fruits and vegetables so headed to the Publix grocery about 1.25 miles away. 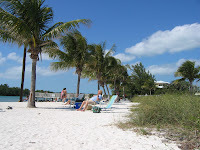 You can tell you are in the Keys with the higher prices and the lower quality and quantity of items. After lunch we biked to West Marine to get a new light and bulb for the damaged one. He had to order it, but will be in a week. We plan to stay anywhere from 2 ½ weeks to a month here so it works. The two bike trips helped us to get our bearings of where things are such as the Kmart, Home Depot, CVS, and local restaurants and marinas. We had thought to bring our showering gear with us, so before returning to the boat we showered. We luckily did not have to wait long. There are only three, yes, I said three showers for all 250 boats! And there are only three washers and three dryers. They have a lovely new shower facility built with probably 16 showers but there is some problem with the local municipality allowing them to hook up. Bureaucracy! We learned that there is a cruiser’s net for Boot Key Harbor on channel 68 at 9am. They welcome new boats in the harbor, have announcements and people can ask questions or ask for help from computers to boat repair. We found out that we had missed the “Meet and Greet” on Wed. evenings which would have been under the cabana, so we will have to wait for next week. We decided to go into the marina office to wait for the call from Pat and Ken. 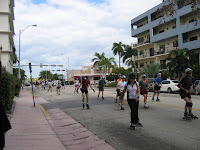 We ev entually connected and walked across busy Rt.1 (a feat in itself because it is 4 lanes with no island) to a restaurant called the “Stuffed Pig.” Only in the Keys do you get a name like that! 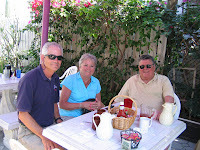 They had a lovely outdoor patio where we had brunch and caught up with each other’s news. It was great seeing some familiar faces after so many months of new places and people. Our boat got assigned a mooring ball today and so we spent time pulling up the anchor and relocating. 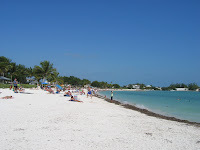 We decided to explore, so got gasoline for the dinghy and headed out to see what Sombrero Beach was all about. It was lovely, with lots of sand and nice park facilities behind it. I know I will plan to visit here as frequent as possible. 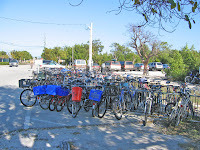 We then motored to the dinghy dock, got our bikes and rode to Home Depot and K Mart for a few necessities. We then went back to the boat to relax, have dinner and spend a peaceful night knowing we won’t drag anchor. Are we in paradise yet? Only time will tell! 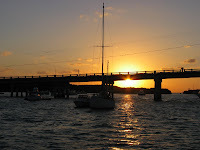 It is Frida y the 13th and we left No Name Harbor to anchor off Pumpkin Key. I wanted to stay another day in No Name but Al heard it gets very crowded and hectic from local weekenders, so we left. Pumpkin Key is a small private island with two homes on it. There were about 4 boats anchored here. We got in fairly early so I used our kayak to go around the island while Al repaired our oar lock on the dinghy which was loose. Basically it was a “chill-out” day. 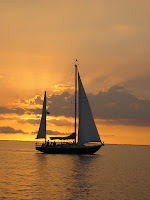 I caught this sailboat going by just before another beautiful sunset. 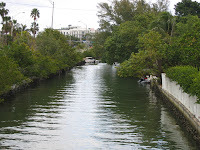 The next day we went through Angelfish Creek to the ocean side again. There was some low water at the entrance and exit but we made it through with no problem even though it was almost low tide. Thought you might like to hear the sounds of sailing! Now the waters are the nice tropical turquoise and definitely not the waters of the Chesapeake as you can see. In the cruising guide, John Pennekamp State Park sounded interesting. I thought someone told me not to miss it, and Al thought someone told him to not bother. I convinced him to phone the park to see if they had a slip or mooring ball for us. They said the moorings were only 4 ft. deep, but they had a slip. So I changed his mind about where we are going from the video. The park is where we were headed when Al suggested we go out to the reef to snorkel since there was not much wind. Someone had giv en him co-ordinates for a place called “Christ of the Abyss” or “Christ of the Deep.” We headed about 4 miles out of way to clear the reefs and went 4 miles out following the coordinates and there it was. There were about ten mooring balls for boats to tie up. As we got ready, I couldn't resist taking a few pictures of Al getting on his wet suit. It certainly was a sight to behold! How do you like his farmer's tan! When we pulled up, we did not know it but we selected the mooring which was closest to the statue which made it very easy to find it. It was spiritual with the light filtering through the water on Christ with his arms raised to heaven and the fish and sea life all around. We were very glad we came out to experience it. I wish I had an underwater camera but no such luck.This was part of our “Journey of Discovery!” The story behind the statue was an Italian gentleman in the diving business had the statue placed there to encourage more business. People come from the State Park on dive boats as well as other places, so his plan did work! 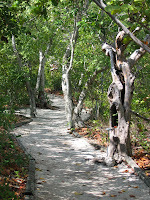 The passage to get to the State Park is very narrow canals through the mangroves. Sport fishing boats zoom by and wide tour boats are entering and leaving. It made for some tense moments. One of the most tense was scraping rock right before going around the dangerous curve at #17 and a mid size tour boat just about to come around the bend. Luckily, we kept moving and got through before the tour boat. We finally got to the marina and the girl was waving us in. The slip was very wide with these four foot square extremely high pilings. As we were trying to get the back lines on those pilings, the dock girl was trying to keep our bow off the dock, when I turn to hear crunching and the housing on the navigation light fall into the water. All I could think, was that the bad luck of Friday the 13th came one day late to us. Of course, Al’s mood quickly disintegrated especially because “I” was the one who wanted to come here. We were able to retrieve the light housing for Al to see if it could be fixed. I finally made dinner for my valentine with chocolate dipped strawberries for dessert. I was hoping to end the day on a more positive note! Al worked on the navigation light and got it to work but he would have to glue the housing on. Since they have a West Marine .9 mile away, we walked there to see if they had another light and a starter switch. Yesterday when we were at the snorkeling sight, when we tried to start the engine we had difficulty. So, before it gives out completely, we wanted to replace it. They had the switch but not the light Al wanted. We walked the park grounds, seeing the Welcome Center, Aquarium, two beaches the docks where tour boats and diving boats leave, as well as their rental center for canoes and kayaks and their campground. A lot of people were fishing all around the area too. 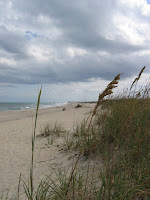 It is a very good state park and rated in the top ten in the US. There biggest problem was their marina with only about nine slips. One for a 40 footer, most were smaller and none had finger piers for easy access on and off the boat. After lunch I chose to go to read on the beach while Al put in the new starter switch. When I came back I saw something moving along the edg e of the sea wall. It was a very large iguana. It came over to our dock like he owned it. He wasn't afraid of people and most stayed away because no one would want to be hit by his tail! Later, we had drinks with a couple who sailed up from Marathon. They are from Wisconsin and trailer their 27 ft. Norsea to Marathon for the past four years. We got a bit of information about Marathon from them since we will be arriving there in two days. Now we will know somebody there! I finally got someone to take our picture together so you know we are both here! Al calls our trip “The Voyage of Discovery” which I think definitely applies here. We are discovering all sorts of things about the people we meet, and places we visit, but also about our boat; what we like, what we would change. More importantly, we are discovering all sorts of things about ourselves; do we like this way of life, can we be together 24 hrs. a day, can we be without a marina for more than a week, can we cruise alone (without our sailing friends which is how we sailed on trips for the past 34 years). One of my needs is to have it quiet to fall asleep. The noises of the boat on a windy night or noises from other boats have always been a problem for me. Al has gotten up many a night to tighten a line because I here it banging while he snores on. Well, I finally “discovered” a solution, my MP3 player. I put in the ear plugs and put on Enya and I have fallen asleep before the end of the CD and before it shuts down every time. So as Al says, there is a reason in this world to listen to Enya! 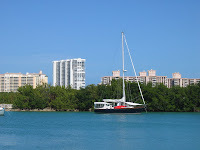 After leaving Coconut Grove, we decided to just sail around a bit and enjoy the wind and the lapping of the waves again. We did not have far to go, so we just played a little. We g ot to No Name Harbor, and as expected, it was full. The cruisers planning to cross to the Bahamas were all there waiting for the wind to head from east to southeast so they had an easy crossing. 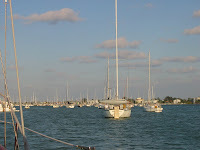 We turned around and anchored on the west side of Key Biscayne. We watched dolphins surfacing on the water as the sun was going down. This was the first night since leaving in October that we left ports open because it was staying warm! The winds had lightened a lot so it was a very quiet spot for the night. I did not even have to use Enya to put me asleep. It was a very pleasant night until our phones rang one after another at 3:30 in the morning. Nothing like having a heart attack, knowing something must be horribly wrong. All it ended up being was our home security company calling and saying there had been a power failure. They knew the eastern states were having some bad weather but she had to call. We very seldom lose power, so just to be safe; we called our local police to do a run-by the house just to be sure. Much later in the morning I called my friend and she reassured us that winds had been up to 50mph. 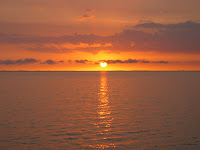 Since the winds shifted in Florida for a good weather window, many cruisers left No Name Harbor so we moved over there. Once on shore we saw two ladies heading into town, so we joined them to learn the ropes of Key Biscayne. It is a very well manicured area with lots of condos, and grocery, CVS, post office, hardware store and many other small shops that cruisers need. 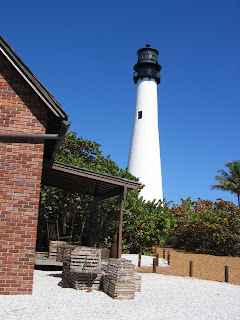 After lunch we went to explore Bill Baggs State Park which is where No Name Harbor is located. There is one washer and dryer there for the cruisers, bathrooms, but only a cold water shower. There are excellent biking and hiking trails so we decided to hike today. 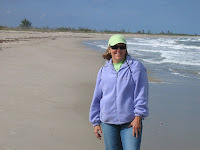 We walked along the shoreline to the Cape Florida Lighthouse. 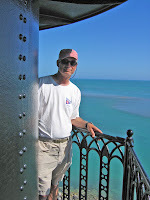 It was a beautifully restored lighthouse and light-keeper’s house with a great video explaining its history. 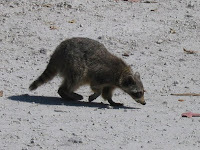 We stopped for a snack at the park’s concession stand and learned first hand about the annoying raccoons in the park. They come right towards you and they don’t shoo away too easily. They actually warn you about them in the park’s information. So much for being nocturnal creatures! I then went to the lovely beach (supposedly ranked one of the top ten in the US) to sit and read and listen to the surf while Al went back to the boat to tinker. Later we went to the small restaurant in the harbor for dinner, simple but good meals. We noticed others were ordering Whole Fried Fish. It certainly looked interesting, maybe next time we will “discover” how it taste! Labels: The "Voyage of Discovery"
We left the anchorage off of South Beach and did not have a definite place to go today. We knew we would not be going far, about 13-18 miles, but waited until we were underway to decide our final destination. 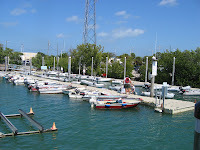 We wanted to get water, fuel for the dinghy and a pump-out so we went into Crandon Park Marina on the north end of Key Biscayne. It looked like a very nice marina but usually do not have many transient slips available. Luckily we did not want a slip, but the other necessities mentioned. They had all three but the pump-out broke earlier that morning, just our luck! Although the winds were out of the east, they were lighter (10 -12 knots) so we decided to go to the west shore and check out Coconut Grove. Due to the Miami boat show we knew they had no slips for a 41 ft. boat at Dinner Key Marina, because we had called a few days earlier. You can anchor out there and decided it wasn’t too lumpy so we that is what we did and put out two anchors just to be sure. Al went once again to a neighboring anchored boat to get information. He hit the jackpot because the couple was local and knew a lot. This couple, Phil and Nell on Upside Down just sold their last vehicle because they plan to leave in March to sail the world the next five to ten years. 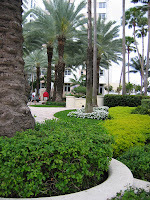 They are living in a very nice suite in a hotel until they leave near the Coconut Grove Sailing Club to which they are members. You meet a lot of interesting people cruising. After lunch we went into the public dinghy dock to see some of the area. We were told to be sure an d lock your dinghy because of some unsavory characters that are around. 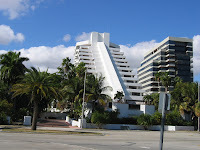 The condos and hotels have very modern and unusual architecture which was interesti ng. 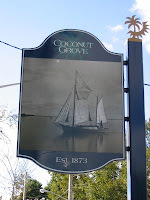 And of course, there were the usual nice shops and restaurants all around in the Coconut Grove Business District as well as a great gourmet-type market next to City Hall which is along the waterfront. At the boat that evening, after dinner, Al was using a toothpick when one of his caps came off. Now what do we do?!! I said to Al, “I don’t know which is worse - having your ‘bod’ or your boat break down!” We figured nothing could be done until tomorrow so we went to bed. Nell had given us. Our taxi had already left so we entered the dentist office and they said the dentist had moved her office about a year ago, but Nell must not have been aware of it. The dentist whose office we were in said they could take Al, so I called and canceled the other dentist while Al got his cap cemented back on. Next door was a grocery, so I picked up some things we needed. The dentist office called us a taxi and back to the sailing club we went and all done by 11am. Some things work out rather nicely, and all because Al met some nice local people! 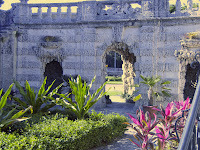 After lunch we wanted to visit Vizcaya, the winter home of International Harvester vice-president, James Deering. We walked almost 3 miles to get there but it was well worth it! It provided a glimpse into the wealthy lifestyle of the early 20th century. 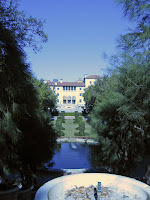 It was built between 1914-1916 and designed to be similar to European estates that Deering had visited. He went on buying sprees and purchased all the furniture, lighting fixtures, doors and fireplaces all over Europe and had them shipped here. What I found amazing are the modern conveniences that were built in, including central heating, an automatic electrical telephone switchboard, 2 eleva tors, refrigeration, central vacuuming system and a fire control system. Remember, this was in 1914! 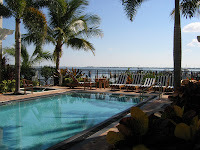 It is on the water and has a beautiful view of Biscayne Bay. Unfortunately, various hurricanes have damaged the Stone Barge which you see, but it is suppose to be restored in the near future. The surrounding formal gardens were magnificent. Yo u can certainly understand why it is a designated National Historic Landmark. The other interesting tidbits about this place are that in 1994 Clinton held the Summit of the Americas with 34 leaders of the Western Hemisphere here. 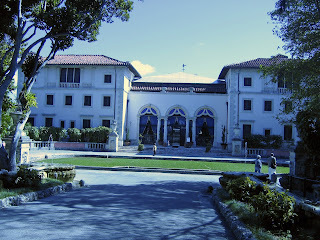 In 1987, then President R onald Reagan met the Pope here and Queen Elizabeth II toured the estate in 1996. No pictures were permitted inside so I can only show you the outside. It definitely was worth the six mile walk to and back again, plus we got the exercise we needed! We left Fort Lauderdale via the Port Everglades inlet, but before we even reached it, we were stopped by Harbor Patrol for about fifteen minutes due to a barge and another huge vessel entering the inlet. That was okay by me, I would rather wait than meet them in the narrow inlet! Our forty-one ft. boat looks like a peanut next to them! Once out in the ocean we rolled out our genny (that’s the forward sail for all you non-sailors) for our downwind sail going about 5.5 knots. It was not too bad with the 4-6 ft. waves with the direction we were going. We definitely enjoyed our enclosure once again due to the fact that they had record lows in the lower thirties. We will keep heading south. We got to find warmer weather somewhere. However, I even heard Key West had a record of 55 degrees one day. The sail was uneventful but enjoyable. 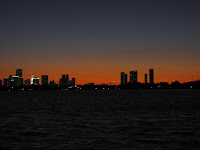 We entered Government Cut inlet at the Miami area and anchored off South Beach and Belle Isle in Biscayne Bay. We decided to not go ashore until tomorrow, so Al took the dinghy to talk to another cruiser who was familiar with the area. He found out where to land the dinghy for our exploration of South Beach tomorrow. You can certainly see a different kind of skyline versus some of our usual sunsets. Al checked our log on the GPS and so far we have traveled 1,159 miles since leaving Oct.18th . We hav e been gone for 94 days (I did not include the days we returned home for the holidays.) and we haven’t had a mutiny yet! F rom there we walked to the Holocaust Memorial not far away. This was a very solemn and moving tribute to the horrific wrongs done to all those, men, women and children. It sent chills up my spine and tears to my eyes. 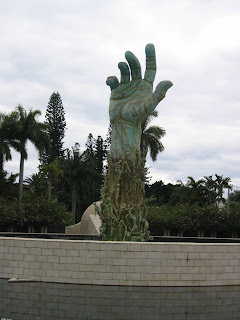 It was a very well done memorial with a wall of all the names of people who died and the sculpture of the hand with skeleton-like people trying to climb up. It also gave historical background about the Holocaust as well. We walked onto the Botanical Gardens which were nice but not very large. We went further into town to see Lincoln Rd. 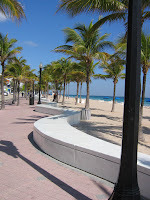 which is a pedestrian mall where a lot of restaurants and stores are as well as Ocean Dr. along the waterfront and did a lot of people watching. I must admit there wasn’t one store that I passed that had anything I would want to w ear. It was definitely for the young and adventurous dresser. Al was glad nothing was of interest to me, but he was disappointed that the chilly weather caused the young “chickies” to cover up rather than bare their skin as usual. We had lunch at one of the many outside restaurants, people watching all the while. It is an interesting place. Back to the boat for dinner and reading. 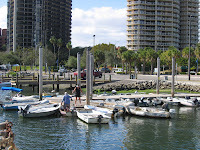 When we went back to the boat Al noticed another boat whose captain he spoke to in Ft. Lauderdale. He invited us over for Happy Hour. When we went over, two Maltese dogs greeted us, Rocky and Spike. The two cutest little dogs and friendly as any dog I have met. The one stayed on my lap the entire time I was there. Another young couple came over also, that Randy had invited. This couple was in their late twenties and heading to the Bahamas to get married. Their family and friends were coming in on the 15th and the wedding is the 21st. They are going to be close getting there on time because a good weather window to cross to the Bahamas isn’t expected until Thursday and today is Saturday. Also, the island that they are going to is not the first one at which they will arrive. Oh, to be young and carefree. Did I mention they are going to sail off to far off places afterward! Al decided we would stay one more day, which we did. About all we got accomplished was three loads of laundry. We packed it all up, took it in by dinghy. We were told to get on the local bus and tell the driver you want a laundry. We waited for a long time and the bus did not arrive, so we walked and we finally found one. We did the laundry and came back to the boat. It took three hours. Then you have to put the clean sheets onto the v-berth. A feat only mastered by the best, Al Mauger! One of these days I will have to take a video of his masterful feat with him on his knees rolling and wiggling from one side to the other. It should make a great hit on the internet! We are “on the road again” like the song by Willie Nelson or should I say “on the water again” heading further south. 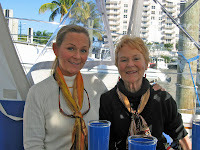 We left our friends we met in Stuart and the luxurious Harborage Marina and all it’s amenities (as you can see in our photos) on Sunday, Feb. 1st. Before leaving I finally got to go kayaking with Dorothy and Chick Hundley on Illusion for an afternoon, and Al and I went to the Arts Fest in Old Town Stuart for a look at some great juried art and crafts. Maybe we will stop to visit the old stomping grounds and see friends on the way back. 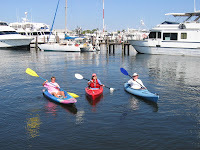 We have no definite plans except to try and be back in to our marina in Rock Hall, Md. by the end of May. We headed to a not too distant destination, Peck Lake. It is not a lake as we know, but a wider section on the ICW where you can pull over and anchor. What is very nice, is that you can land your dinghy in the small sandy beach and walk the short path across and you are on a wonderful wide white beach on the Atlantic. We had a great walk along the coast and we saw all of four people. However, when we went back to our dinghy, we passed about a dozen people getting off a community pontoon boat which must ferry people across, a nice perk for their community. We explored in the dinghy a bit, and returned to the boat to prepare to watch the Super Bowl. We got to see most of it. I say that because it kept going in and out due to the way the boat was positioned and the rains coming and going. We actually saw all the important plays that made my former hometown, Steelers, win! The most frustrating time it went out, was in the last three minutes of the game when the Cardinals were coming down the field to make a touch down. It did not return until the Steelers threw and caught the winning touchdown. What a sight to see! The next day, Feb. 2nd (Ground Hog Day) on the Cruiser’s net on the single side-band radio we heard that the ground hog saw his shadow so there will be six more weeks of winter. So sorry you northerners! 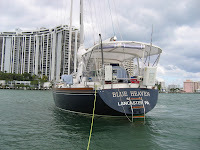 Speaking of Cruiser’s net, today we had the best connection of any day we tried to listen and Al finally was able to check in with our boat name and location and they actually heard him in the Bahamas. We listen many mornings at 8:30am for other boaters we know, and another day we heard our Canadian friends who headed to Mexico when they were crossing over, so you can hear quite a distance. After Al pumped out the rain water in the dinghy, we headed out for our next destination of Lake Worth. After motoring through seven bridge openings we reached a very lumpy Lake Worth because the wind was blowing 20-24 knots. We anchored at North Lake Worth because Al said the winds were to clock around to the northwest which would make it calmer. After a few hours of those windy conditions, it finally quieted down for the night. 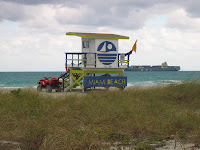 We thought we would be spending several days here because of windy conditions, but after analyzing the weather data, we felt that Tuesday would be the best day to go out the inlet into the ocean to get to Fort Lauderdale. Before we went to bed, we put the dinghy on the foredeck so that we would be ready to leave the anchorage by day break. 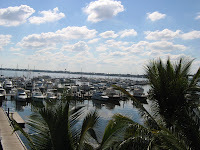 We arrived at Las Olas Municipal Marina in Fort Lauderdale after passing the luxurious homes and boats. 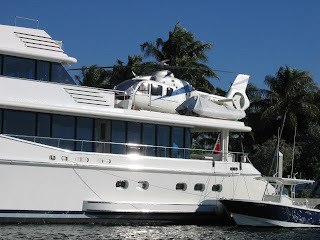 Take a close look at the back of this yacht with a helicopter on the back upper deck! Talk about a lot of money. It must be nice! We plan to stay two nights so that we can visit with Al’s Aunt and cousin. Also, the temperatures are suppose to plummet to the thirties. Aren’t we lucky to be here for a record breaker! Later in the afternoon Al's Aunt B.J. and cousin Leslie came for a visit and to see our home on the water. They were gracious enough to take us for some groceries and then we went out for dinner. It was great seeing them again. That evening Al studied about three or four forecasts from various sources to determine whether we should leave to go to Miami tomorrow. We need to go out in the ocean to get to Miami, because our mast is 61 ft. and one of the bridges is only 56 ft. After much studying, he determined tomorrow would be the day to go. After tomorrow the wind is to clock around to the east which will not be good for sailing south in the ocean. It is calling for north winds 15-20 knots with seas 4-6 ft. I guess we will see what seas are like at that height.